What is a Maintenance Inspection Checklist? 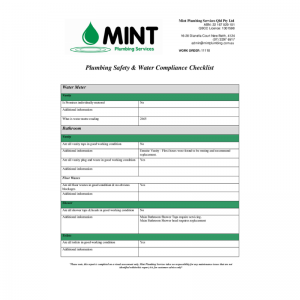 What is a Maintenance Checklist? If it has been a while since your plumbing systems have been checked, your home could be at risk of developing minor or major leaks which could end up costing you hundreds of dollars, over a period of time. The checklist has a series of points that must be checked to ensure that your home is thoroughly inspected by our tradesmen and additionally, you will receive a completed report (see images). What is covered in the Maintenance Checklist? 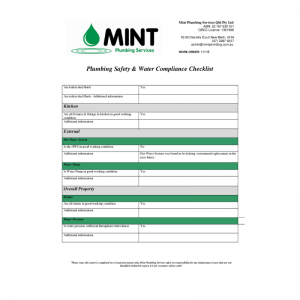 The Maintenance Checklist will cover all crucial components of the plumbing systems at your home, including all pipes, valves, hot water systems and drains. Upon your next appointment with our team, please alert the tradesman upon his arrival that you would like a Maintenance Checklist completed for your home. As this is a free service, our tradesman will give you the report upon completion for you to view. This will give you the opportunity to think about any further work that might be necessary in the future. Why not call us today on 07 3297 6517 for an inspection or send us an email? https://mintplumbing.com.au/wp-content/uploads/certificate-1.png 312 820 Kirsten Ratcliffe https://mintplumbing.com.au/wp-content/uploads/Mint-Logo-2.png Kirsten Ratcliffe2019-03-27 12:45:142019-03-27 12:46:54What is a Maintenance Inspection Checklist? What is rough in plumbing? Whether you are renovating your current home, building an addition or a new home, it’s an achievement when certain stages are completed – because this means that your project is moving along! One of these stages is when the initial plumbing lines are installed and this is called the ‘rough in plumbing’. Essentially, this is when your plumber installs the plumbing pipes inside the walls and before the plasterboard is applied over them. Usually, the rough in plumbing stage only takes place when the roof is on and the house has been deemed weatherproof. Once the rough in plumbing has been completed (as well as the electrical rough ins), and before the plasterboard is fixed to the walls, the work needs to be reviewed by the building inspector. If the rough in does not pass inspection, them the inspector will issue a change order and review the work a second time, before the walls can be plastered. Any changes made by the homeowner are best discussed during this time, before the walls are sealed with plasterboard. This is the easiest time to make any design changes to your plumbing and it’s also the cheapest time – when the walls are still not plastered. You will need plumbing in the kitchen, laundry, bathrooms, wet room, outdoor kitchen, and possibly even in a shed, garage or the garden. This is a lot of plumbing that needs to be completed to a high quality and on schedule so that it can pass inspection and the build can proceed in a timely manner. It’s important to realise that rough in plumbing is installed differently for timber and steel frames. For a timber framed home or extension, the plumber cuts holes in the timber studs so that the pipes can be run through the walls. The problem is that too many holes, holes that are too big or in the wrong place, can reduce the integrity of the timber frame; this frame will then need to be reinforced. This is one of the issues that building inspectors look for when they make their inspections. On the other hand, steel frames come pre-drilled with holes for the rough in plumbing, so this shouldn’t be an issue. Another problem occurs when the plumbing pipes aren’t secured well enough to the building’s frame resulting in something that plumbers call ‘water hammer’. This is a very loud hammering noise coming from the pipes due to the water and air moving through pipes (which is normal) that haven’t been secured properly. Apart from being frustrating and annoying, unsecured pipes can result in broken pipes in the walls, something that we want to avoid at all costs. This is another problem that a building inspector will check during their rough in plumbing inspection. It normally takes a few days for the rough in plumbing to be completed, which is usually scheduled to be completed just before the imminent arrival of the building inspector. Too early and everyone has to stand around waiting for the inspection before they can do anymore work, and too late means waiting for the inspector to fit you into his schedule again. Find out what causes blocked drains. Mint Plumbing are highly skilled at rough in plumbing – why not call us today on 07 3297 6517 for a fee quote or send us an email? https://mintplumbing.com.au/wp-content/uploads/Depositphotos_13472051_m-2015.jpg 1000 1000 Ruth Wren https://mintplumbing.com.au/wp-content/uploads/Mint-Logo-2.png Ruth Wren2019-03-15 06:00:292019-03-14 15:15:32What is rough in plumbing? Are you searching for information on how to fix a leaky shower head? Well, you have come to the right place! There are four reasons why your shower head may be leaking water: the shower rose is blocked, one of the washers has worn away, the diverter valve is leaking or the cartridge value needs to be replaced. Blocked shower rose: A build-up of lime or other mineral deposits is often the cause of a leaking shower rose, which is easy to fix. First, turn off the water to the shower and either remove the faceplate of the shower rose or the entire shower head (whichever is easier). Soak the shower head in white vinegar and a handful of coarse salt for at least eight hours to dissolve the deposits and if any small deposits remain, use a toothpick or small nail to poke them through the holes (you can also use a small brush). Rinse in clean warm water, refit it and turn the water back on. Worn washers: Washers or ‘O’ rings wear down over time and need to be replaced. For separate hot and cold water taps in your shower, if the leaking water is cold, then the washer of the cold tap needs to be replaced and the same for the hot tap. For mixer taps, check the washer in the shower rose, as this might be your problem. After turning the water off, either replace the washer in the collar of the shower head or unscrew the appropriate tap and replace its washer. Leaking diverter valve: This directs the water to either the shower head or the bathtub and not everyone has one of these. If you have one and it’s leaking, turn the water off and remove the tap handle to expose the diverter valve, remove the valve and clean it with white vinegar and a stiff brush or simply replace it. Leaking cartridge valve: If you have a mixer tap, then this might be your problem. Turn off the water to the shower, remove the tap handle, expose the cartridge stem, undo the hex nut, remove the cartridge using pliers and replace it. We hope these tips on how to fix a leaky shower head have helped, but if you need more assistance, just give Mint Plumbing a call on 07 3297 6157 or send us an email. If you have ever had a pipe burst, you will know that your first thoughts usually concern calling your local plumber in Brisbane and asking them to get there as soon as humanly possible. Just before you pick up the phone, however, always remember to turn off the mains water to prevent the problem deteriorating further, and open the taps to drain them of any remaining water (not forgetting to close them again before the mains is turned on again). 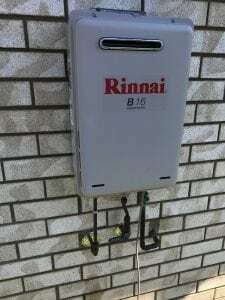 Then remove anything that runs on electricity from the area (water and electricity don’t mix well), and if necessary, turn the electricity off at the power box – just to be on the safe side. It’s only after you have done these steps, that you should call your plumber in Brisbane – once you have the situation under control at home. When we arrive, our approach to fixing your problem depends on whether the burst pipe is inside or outside your home. Sometimes it’s obvious where the problem is located, because we can see a puddle of water forming on the ground or a jet of water when we turn the water back on! Other times, there is no overt evidence of a burst pipe, so we use our CCTV camera to scoot along your underground pipes and find the fault, crack or break. Once identified and located, we can dig down and fix the problem. It’s best if your plumber in Brisbane uses CCTV to locate the problem, otherwise they can end up digging numerous holes in your garden, simply trying to locate the burst pipe! Locating burst pipes indoors is usually much easier, because the evidence is much clearer, for example water collecting under the kitchen or bathroom sinks. These obvious leaks aren’t usually difficult to fix, because the pipes can be easily accessed. It’s when pipes burst in the walls and behind the plasterboard that it can take longer to fix, but it’s still fairly easy to spot the leak. If you want an experienced plumber in Brisbane to fix your burst pipes, call us on 07 3297 6157 or send us an email for a free quote. Commercial plumbing to the rescue! Commercial plumbing requires a different skill set to domestic plumbing, simply because these plumbers perform a range of highly specific jobs for businesses. Of course, a commercial plumber will replace taps, showers, fix broken sewer lines and toilets, identify leaks and blocked pipes (just like residential plumbers), but they do all of these jobs in large complexes, such as shopping centres, high rise flats, hotels, restaurants, factories, warehouses and many other commercial establishments. If we take a large shopping centre for example, commercial plumbing covers the installation and repair of gas systems, fresh water fountains and fire sprinkler systems, as well as bathroom fixtures and plumbing for customers and staff, kitchen installations, grease traps and backflow prevention devices that are needed for the shops, cafes and restaurants. So a commercial plumber does all of these jobs, as well as those mentioned above for residential homes (fixing leaks, broken toilets and blocked drains). In addition, commercial plumbing also includes the initial installations of these fixtures during the building stage and an ongoing maintenance program for all commercial establishments. Essentially, a commercial plumber makes sure that the building’s fresh water pipes, sewage and stormwater systems are all working correctly and the fresh water is clean and free of contaminants. They also deal with a much larger and more complex range of jobs than a residential plumber and they often need to work in confined spaces and must be able to work safely at heights. To perform all of these tasks, a commercial plumber needs to keep up to date with all the relevant health standards and know which apply to each type of commercial business. When selecting a commercial plumber always check their experience to make sure that they can deal with the range of complex problems posed by these large buildings. Your best strategy is to arrange a maintenance program with a commercial plumber who will then be on call for any problems. This means that you can call a plumber who knows his or her way around your building and has the experience to do a good job. Call Mint Plumbing for all your commercial plumbing needs on 07 3297 6157 or send us an email today. 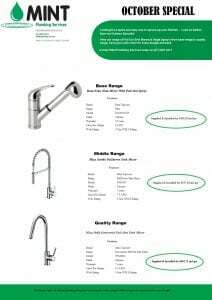 https://mintplumbing.com.au/wp-content/uploads/commercialplumbing-mintplumbing.jpg 667 1000 Ruth Wren https://mintplumbing.com.au/wp-content/uploads/Mint-Logo-2.png Ruth Wren2019-01-23 06:00:512019-01-22 12:41:31Commercial plumbing to the rescue! Have you had your storm water drain checked lately? With the storm season just around the corner, it’s the right time to make sure that everything is shipshape on your property and that you are prepared if the worst does happen. In Brisbane, we often experience severe weather that causes roofs to fly away, outdoor furniture to blow over and flooding that erodes soil and devastates properties. Here are a few actions to take around your property that should get you through the worst of the storm season. One of the first things to do is to make sure that all your trees are healthy and trim any branches that look diseased, dead or overhand your home. Next, you should clear away any debris or blockages in your storm water drain, as well as your gutters and down pipes. Secure any loose objects or furniture in your backyard and if they can be moved to a secure area, that might be the best option. Make sure that you know the council depots that will issue free sandbags in your area, particularly if your suburb is prone to flooding. If you know that a storm is likely, make sure that your smartphone is fully charged, disconnect all electrical appliances and listen to a battery operated radio for further information. Park your vehicles undercover or if that’s not possible, cover them with tarps and blankets to minimise hail damage. Keep everyone inside your home, including pets. When the storm arrives, don’t go outside, but keep everyone inside and away from the windows. If possible, settle everyone into one room, usually the bathroom as this is most likely the safest room in the house. However, if you are caught outside in a storm, don’t stand under trees or power lines, stay away from creeks and if you are driving, pull over somewhere safe and in the open. Once the storm has passed, make sure everyone is safe and then check your property for damage. If you see that your storm water drain is overflowing, you might consider giving Mint Plumbing a call to find out if there is a blockage or the overflow was simply due to an excess of storm water. Call us on 07 3297 6157 or send us an email. How often have you stood in your shower wondering why the water is so slow to drain? You remove any hair that has become lodged in the drain, grab the plunger, go to the hardware store in Logan to buy some of those crystals that are guaranteed to fix blocked drains and then stand there in dismay, because nothing has worked. Your next step is most probably to call the plumber, but there are a few other things you can try to fix your problem before making that call. Here are a few of the methods that many people find effective for fixing blocked drains in Logan. Baking soda and vinegar: This old remedy actually works very well, so it’s definitely worth trying first. Just mix a third of a cup of vinegar into a third of a cup of baking soda, watch it fizz and pour it down the drain straight away. Leave it overnight to sit and then flush it through with hot water. Salt and baking soda: If you don’t have any vinegar, try mixing half a cup of salt with the same of baking soda and pour this dry mix down your blocked drains. Leave it for 30 minutes and then follow with a kettle of boiling water. Boiling water: If you don’t have any baking soda, you can try pouring boiling water down the drain, because it might work. Don’t pour it all in one go, pour a third, then another third and the last third of boiling water with about 10 seconds between each pouring. Caustic soda: If the first three methods didn’t work on your blocked drains, it’s time to call in the big guns. Caustic soda is deadly, so you need to wear gloves and eye protection when using it. Mix 3 cups of caustic soda into 3 litres of cold water in a bucket, stir with a wooden spoon or bit of timber, let it fizz and pour it down the drain. Leave it for 30 minutes and then flush it away with a kettle of boiling water. If you have tried these four easy methods and you still have blocked drains, call us on 07 3297 6157 or send us an email and we will head straight over to Logan and fix your problem. How does a professional plumber expand their business? If you have been working as a plumber for a number of years with your own business, you might be ready to consider taking it to the next level. There are a couple of options open to you that will allow you to grow your business, so let’s take a look at a few of them today. Invest in your business: Hiring an additional plumber or an apprentice is a great way to increase the size of your business. This approach however, involves additional funding for a second van and equipment, so always check your local council for small business grants, before asking the bank for a business loan. Expand your skills: Upskilling to become a gas fitter is one of the easiest ways to expand your business as a plumber and so is becoming a welder! You might be surprised to learn that the more complementary skills you have under your belt, the more you can actually expand your business. Check out your local tech college for any courses that teach complementary skills, such as gas fitting and welding and don’t forget to claim them on your taxes! Specialise in one area: You might think that specialising in one area might reduce your work, not increase it, but if you become really good at something you can build a very successful business! Take for example, a plumber who loves working on new build residential homes. If you become very good at what you do and build a reputation within the local area for your quality work, you will start to be called more and more frequently when a new development needs contractors. Setup a website: Too many plumbers don’t market their businesses properly, but if you want to expand your business you can’t ignore the power of the internet and social media. Find yourself a good website developer to design a customised website for your business and find someone else to manage your social media. It’s another way that every plumber should be investing in growing their business and it’s all tax deductible anyway! If you need a good plumber with years of experience under their belt, call Mint Plumbing on 07 3297 6517 or send us an email. https://mintplumbing.com.au/wp-content/uploads/growyourbusiness-mintplumbing.jpg 667 1000 Ruth Wren https://mintplumbing.com.au/wp-content/uploads/Mint-Logo-2.png Ruth Wren2018-10-31 06:00:072018-10-17 23:10:56How does a professional plumber expand their business? Could you live without plumbing in Brisbane? Have you ever thought what life would be like if we didn’t have plumbing in Brisbane? It’s not rocket science, but a life without plumbing wouldn’t be the same and would change our lives dramatically for the worse. The world has quite literally, been changed by plumbing, so let’s take a look at some of these wonderful changes. Toilets: Gone are the days of the outdoor dunny and chamber pots under the bed, now we have indoor toilets and some of us even have those high-tech toilets that work by remote control. In the early days, rich aristocrats would have had indoor water closets, but they wouldn’t have been connected to a sewage line, instead just being a ‘long drop’. Just imagine the days when you had to go outside to use the dunny, it would feel as if you were permanently camping – plumbing in Brisbane has come a long way since then! Hot water: How would your day start if you couldn’t have a hot shower? Would you bother to heat the water over a fire or would you just have a cold wash? On demand hot water has meant that we can all attend to our daily hygiene needs quickly and in comfort and we also don’t have to boil a cauldron and slap our clothes on rocks to do the laundry! Indoor plumbing: Did you know that it was Gough Whitlam who introduced Australia to indoor plumbing? For many people, one of Whitlam’s greatest legacies was bringing indoor plumbing and flushing toilets to western Sydney! Council sewerage systems: Before the introduction of modern council sewerage systems we either had ‘long drops’ or all the waste went into the local creek or river. In fact, if we go way back, then all the waste was just emptied onto the streets into open sewers, leading to obnoxious smells and the continual spread of disease. The oldest outdoor plumbing in Brisbane is a sewerage pipe that heralds from 1915 and runs 12km from Toowong to the Eagle Farm Pump Station and it’s still in operation today. If you are having any problems with your plumbing in Brisbane, call us on 07 3297 6517 or send us an email. https://mintplumbing.com.au/wp-content/uploads/plumbing-mintplumbing.jpg 667 999 Ruth Wren https://mintplumbing.com.au/wp-content/uploads/Mint-Logo-2.png Ruth Wren2018-10-18 06:00:322018-10-17 22:59:49Could you live without plumbing in Brisbane? Calling your plumber in Brisbane can help prevent sinkholes! Sinkholes opening up under people’s homes have been in the news lately, but how can calling your plumber in Brisbane prevent a sinkhole from developing? Well, there are two causes of sinkholes, either nature or man-made, and whilst the ones caused by nature can be outside the realms of your plumber to prevent or fix, the man-made sinkholes can be prevented by your local plumber. In 2013, a sinkhole opened up below the bedroom of a Florida home in the USA, swallowing the occupant who was in bed at the time and who has never been found. The sinkhole was 10 metres wide and 20 metres deep, whilst the one that swallowed a three-story building in Guatemala during 2010 was 60 metres deep. Sinkholes occur when acidic rain filters into the ground, dissolving rock and forming caverns that eventually collapse, resulting in a cavernous hole. If found early enough, they can be rectified, but it’s not often that this happens. These type of sinkholes will require more expertise than a simple plumber in Brisbane to fix! Man-made sinkholes, such as the one that opened up in Ocean Shores, just south of the Gold Coast in NSW can be caused by a broken storm water system or sewage pipes. This small hole that opened up in 2013 was only 40cm wide, but it was at least 2 metres deep and posed a significant threat to local residents and traffic. These sinkholes occur when underground pipes leak water, causing the surrounding soil to become eroded, and creating an underground cavern. A sudden and heavy downpour can make the ground too heavy to sustain and the roof of the cavern suddenly gives way and collapses. The way to ensure that these man-made sinkholes don’t open up on your property is to have your local plumber in Brisbane check your underground sewage pipes and your storm water system for any cracks, breaks or leaks. You also don’t want to have the drain pipes from your roof emptying onto the ground and not into the storm water system. Another tip is to watch for sagging trees or fence posts in your yard, as well as doors or windows that no longer close properly, as these might be signs of an imminent collapse and formation of a sinkhole. Call us on 07 3297 6517 or send us an email and we can come out and inspect your sewage pipes and storm water system, just to be on the safe side. https://mintplumbing.com.au/wp-content/uploads/sinkholes-mintplumbing.jpg 667 1000 Ruth Wren https://mintplumbing.com.au/wp-content/uploads/Mint-Logo-2.png Ruth Wren2018-10-01 06:00:402018-09-21 13:12:24Calling your plumber in Brisbane can help prevent sinkholes! A leaking toilet can not only be annoying (listening to water dripping 24/7 is enough to send you a little bonkers), but if not identified and fixed early, it can also increase your water bills. Calling your plumber is the best way to deal with the problem, but what if you aren’t sure that you have a leak, just a suspicion? The easy way to determine whether your toilet has a slow leak is to add some red or blue food colouring to the cistern, wait for 30 minutes and then check the toilet bowl. If you see that the water has changed colour, then you know you have a slow leak. Check the outlet valve: This is the device that lifts up to let the water enter the toilet bowl. It can sometimes be misaligned slightly or the arm that raises and lowers it can be caught on something that stops it fully closing. Clean it and reset it, or even replace the rubber seal and see if this fixes your leaking toilet. Check the inlet valve: If the inlet valve isn’t closing properly it can cause a slow leak into the toilet bowl, so lift the float up and if that stops the leak, you have found your problem. You might need to adjust the level of the valve, replace the washers in the valve, or call your plumber who can have it done in a jiffy. Check the flush pipe seal: This is the seal between the cistern and the bowl and is a bigger job than the others mentioned above, so you might prefer to leave it to your local plumber to fix. If you’ve done all of the above and you still haven’t found the cause of your leaking toilet, you might want to call us on 07 3297 6517 or send us an email and we can rectify the problem quickly for you. Hot water system replacement isn’t always necessary, but if you are running out of hot water and suffering through cold showers, maybe it’s time to give it some serious consideration? Winter is not the time you want your hot water system to fail, however it is the most common time of the year that they will fail. Hot water systems rarely just completely stop working. In the weeks and months leading up to a complete system failure, there are usually a few signs that the hot water tank or hot water system is about to stop working. Knowing the signs to look out for could prevent you from needing to organise a really quick hot water system replacement, mainly because you don’t have the time to spend researching different systems and want your hot water back! We outline below 3 of the signs to look out for that may mean your Hot Water System is on its way out. The water coming out of your taps should be clear. It should not appear rusty, murky or cloudy. If you turn on your hot water and see water that is unclear or discoloured, seek professional help. A Plumber will be able to determine if the discoloured water is caused by your hot water system or some other type of problem, such as rusty pipes or sewer problems. Check the hot water is running freely from the temperature & pressure relief valve. This can be found on the side or at the top of the unit. Unfortunately, if you have checked all of the above or if you try to use hot water and nothing comes out, seek help from a professional plumber immediately. 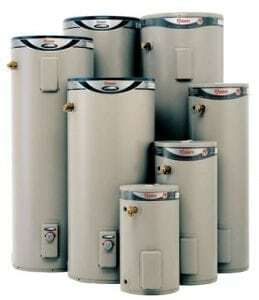 Hot water systems do make a certain amount of noise, but they should not be making any banging or rattling sounds. Excessive noise indicates dirt or sedimentation build up within the system. If you notice any loud noises coming from your hot water system, seek professional help immediately. A hot water system replacement unit should last on average 10-15 Years, however to increase the life of your hot water system and avoid these issues we recommend scheduling a hot water system maintenance check every 3-4 years. If you have any concerns with your Hot Water System, give us a call today Mint Plumbing Services (07) 32976517. Did you know we offer a free no-obligation Plumbing Maintenance Inspection for all our customers when attending their homes or business? With our maintenance inspection, we can help save you money and maintain your plumbing fittings & fixtures, preventing any major disasters occurring on your property – issues that can end up being very costly if they are ignored for too long. 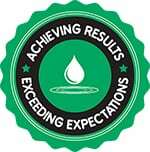 What’s included in our Plumbing Maintenance Inspection? During your Maintenance Inspection we visually check all of the plumbing fittings and fixtures in your home and give you a detailed report on its completion. If we find any problems, we will include our recommended actions (whether these are repairs or replacements) and give you a quote for the work. In the bathrooms, we check the vanities, showers and toilets, as well as the floor wastes to make sure there are no leaks or obvious blockages. We also check the fixtures and fittings in the kitchen, again making sure that nothing is leaking, dripping or in need of repairs soon. For your hot water system, we make sure that everything is working correctly and in tip-top shape, and if you have a water pump, our Plumbing Maintenance Inspection also includes a visual check to make sure that everything looks to be in good repair. We also check all external drains for blockages, as well as measuring your property’s water pressure. If you have any concerns, we can address these at the time of the Plumbing Maintenance Inspection and give you advice regarding replacements or upgrades to your fittings and fixtures (useful if you are considering a renovation in the near future). Have you started your “Spring Clean” but just cant seem to get your toilet any cleaner? 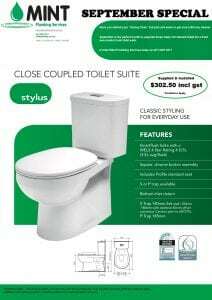 September is the perfect month to upgrade those nasty old stained toilets for a fresh new modern look toilet suite. If you want to keep your home in good shape, you can’t do better than taking tips from experienced and professional plumbing companies – so here are the Mint Plumbing tips for preventing blocked drains in your home. If your household is anything like ours, no morning start’s without at least 2 rounds of coffee! Back in the day, people thought coffee grounds were good for their pipes. “It clears them,” So not true…. Nothing causes more blockages than coffee grounds. Coffee grounds are as good as cement in pipes and overtime will cause an impenetrable nightmare. Prevention – Spread them throughout your garden. Coffee grounds make excellent fertilizer and help to repel insects like ants and slugs. Looking forward to that long hot shower after a hard day, but you get in to realise you are standing in 3 inches of gross clog-water, Long, locks are the main culprits here, but even short hair can contribute to a blocked drain. Left to its own devices, loose hair can quickly turn into a massive glob that’s tangled with soap scum, water deposits and whatever else happened to find its way into your drain. Not pretty at all, remember it’s not just your shower but your bathroom basins also. Prevention – Fit all of your basins, bath and shower drains with strainers to catch the hair (and other particles). Just make sure you clean the strainer regularly! Finished eating that delicious Bacon and Egg feed, your cleaning up and the quickest way to get it all done is to tip all that grease and oil down the drain. Think again….It might be the quickest solution that morning, with a big hang-over but long term that grease is clogging your drain. When you pour hot grease down your drain, it transforms into a lovely hard substance that sticks to the inside your pipes. Then food sticks to the grease, and grease sticks to the food, and grease sticks to the grease…and eventually you have yourself a big greasy mess. Prevention – Save cooking grease in an old coffee can or cardboard milk container, put in the fridge or freezer. When full dispose of it in the trash. If you do end up with a blocked drain, give us a call at Mint Plumbing Services (07) 32976517. As one of the best plumbing companies in Brisbane, we have a range of services we can provide to assist you, including plunging blockage, use of electric eel to unblock, use of jet-rodder to clear blockage with high pressure water & use of CCTV camera to view any further blockages in line. https://mintplumbing.com.au/wp-content/uploads/Slider3-2.jpg 960 1280 Kirsten Ratcliffe https://mintplumbing.com.au/wp-content/uploads/Mint-Logo-2.png Kirsten Ratcliffe2016-08-09 13:15:272018-10-05 13:57:17What's blocking your drains?